"Regrettably . . . too little progress has been made. No agreement is in sight," Jeroen Dijsselbloem, chairman of the Eurogroup, told a news conference. Ministers sent a strong signal that it is up to Greece to make new proposals, he said. The European Central Bank told the meeting it was not clear whether Greek banks would be open on Monday, officials said. The ECB's governing council will hold a special conference call on Friday - the second in three days - to consider adding more emergency liquidity for Greek banks facing a quickening drain on their cash, two persons close to the situation said. European Council President Donald Tusk said in a statement he had summoned heads of state and government of the euro area to meet in Brussels at 1700 GMT on Monday to discuss Greece 'at the highest political level'. IMF Managing Director Christine Lagarde said further dialogue was needed 'with adults in the room'. Greece said it had put a 'radical proposal' for budget monitoring on the table to show its willingness to reach a deal, Finance Minister Yanis Varoufakis said. He accused his European peers of being dangerously close to accepting 'an accident', saying they had refused to discuss his idea for braking public spending. Dijsselbloem said if there was a last-minute deal next week, there would have to be some extension of the current bailout to allow time for disbursement. Greek savers pulled out some 2 billion euros between Monday and Wednesday after weekend negotiations collapsed in Brussels, senior banking sources told Reuters. That is double the amount that the ECB granted Greek banks in extra emergency liquidity assistance only on Wednesday. Asked at the Eurogroup meeting whether Greek banks would be open on Friday, ECB Executive Board member Benoit Coeure said: "Tomorrow, yes. Monday, I don't know," according to officials with knowledge of the talks. The IMF dashed any hope that Athens could avert default if it fails to repay a 1.6 billion euro ($1.8 billion) loan by the end of June, piling pressure on Prime Minister Alexis Tsipras, who shows no sign of yielding to the lenders. If deposit flight continues to outpace ELA, it could force Greece to impose capital controls, as Cyprus did in 2013, to ration cash withdrawals and stop money fleeing the country. The 2 billion euros taken out in just three days represents about 1.5 percent of total household and corporate deposits of 133.6 billion euros held by Greek banks as of end-April. A finance ministry spokesman declined comment on the latest capital outflows. A government spokesman said on television late on Wednesday there was no plan to introduce controls. Tsipras, elected on a promise to end austerity, is demanding a "political level" bargain in which European creditors promise Greece debt relief before he will make any more concessions. But the deposit flight and revenue slump may force him to climb down, with the Greek central bank warning of economic catastrophe if Greece defaults and leaves the euro zone. 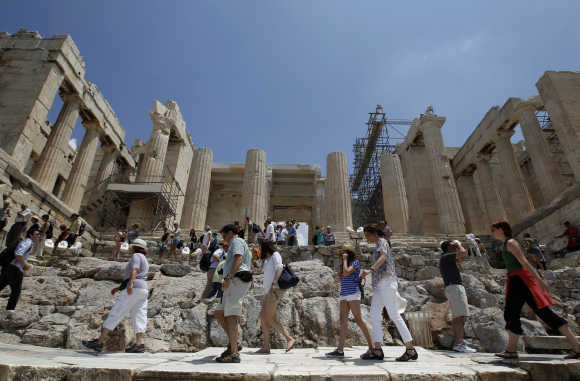 Athens reported a steep 24.6 per cent fall in its revenues in May, including a 50 per cent fall in tax returns, even though the central government posted a primary surplus before debt service in the first five months of this year. Finance ministry officials said it was mainly due to a slump in tax payments by companies, hard hit by a return to recession. Lagarde closed one of Greece's last potential escape hatches, declaring that the global lender would consider Athens in default if it misses the June payment, despite reports there might be some leeway. Greece said on Wednesday that the government does not have the money to repay the IMF loan, which is the first in a series of debt repayments over the summer. German Chancellor Angela Merkel said a deal was still possible to provide Greece with additional funds, if Athens showed the necessary will. But Tsipras - pointedly visiting Russia at a time of sour relations between Moscow and the EU - insisted creditor demands for pension cuts would worsen the economic crisis. In a guest column for Der Tagesspiegel newspaper in Berlin, he sought to dispel what he called a "myth" that German taxpayers were paying Greek pensions and wages. "The blind insistence of cuts (in pensions) in a country with a 25 percent unemployment rate and where half of all the young people are unemployed will only cause a further worsening of the already dramatic social situation," he said. A combination of a default and capital controls could set Greece on a path out of the euro zone and even the EU itself, the Greek central bank warned this week. It would be the first country to leave the currency area or the Union. For its part, Russia quashed speculation that President Vladimir Putin - at loggerheads with the West over Ukraine -- would ride to Greece's rescue. A deputy finance minister told Reuters there had been no request for money from Greece, and Russia had no resources for such a bailout. Financial markets reflected growing alarm about the risk of a Greek default. European shares fell and Greek shares hit a new three-year-low. In a sign of growing nervousness among many Greeks about their country's fate, pro-euro demonstrators planned a rally in central Athens, calling for an end to the deadlock. The previous day, anti-austerity protesters rallied in support of the government and against policies set by lenders. "I'm still convinced: where there's a will, there's a way," Merkel told German lawmakers. "If those in charge in Greece can muster the will, an agreement ... is still possible." Merkel faces growing resistance in her ruling conservatives to granting Greece any more bailout money. A narrow majority of Germans now favour Greece leaving the euro zone.